← Interview and Kindle ebook Giveaway! It is done! My husband’s finest knife to date! This beauty is called Indian Summer. Max was commissioned to design this knife for actor/singer/comedian, Brent Spiner (Star Trek: The Next Generation, Fresh Hell). The project was labor intensive and took nearly nine months to complete during Max’s spare time, often after a 110 mile daily work commute. I watched in awe as he developed new skills during the project and I learned a few new Russian curse words along the way. The custom patterned Damascus steel used for the project was designed by Bob Eggerling. Max painstakingly cut out the form of the blade, smoothed it by hand, and heat treated it right in our kitchen oven to bring out the gorgeous mosaic pattern. 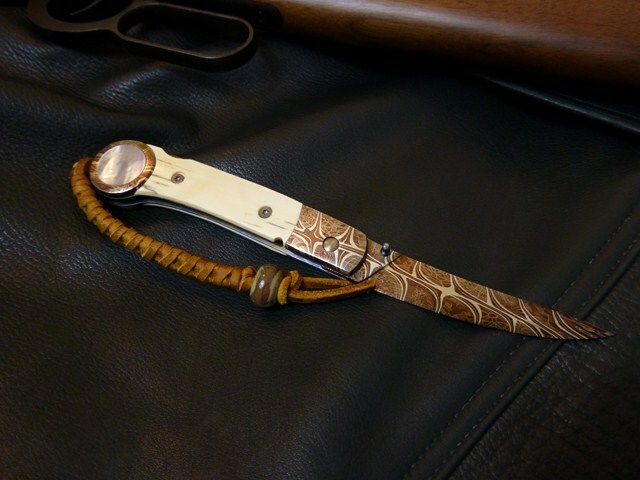 The handle is made of mammoth ivory accented with mother of pearl inserts on both sides. 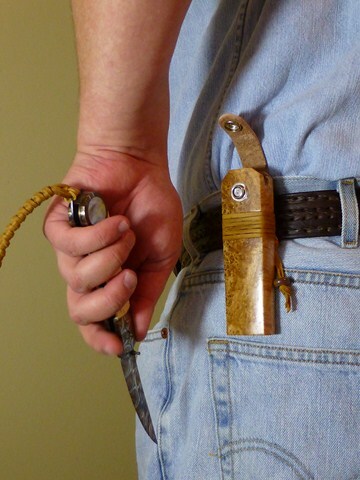 The bead on the hand braided leather lanyard was made from a glass combination Max fused together through lampworking. One of the things Max had the hardest time with was the design for the case. 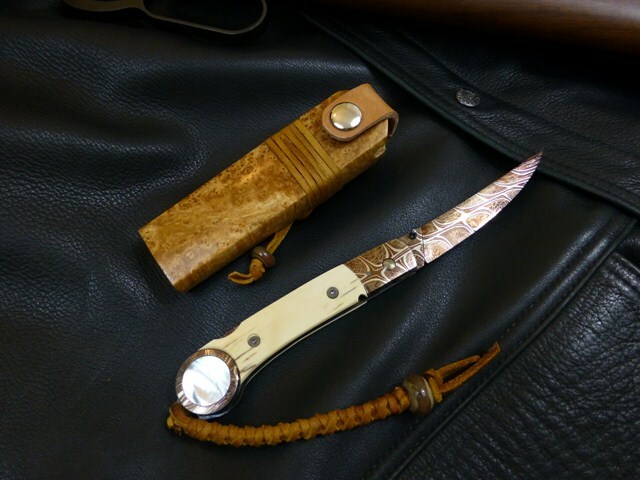 He originally wanted to go with leather, but given the unique curvature of the piece, it didn’t properly accommodate the knife. After much thought, and a few suggestions from me, he came up with this stunning sheath comprised of Black Ash wood. 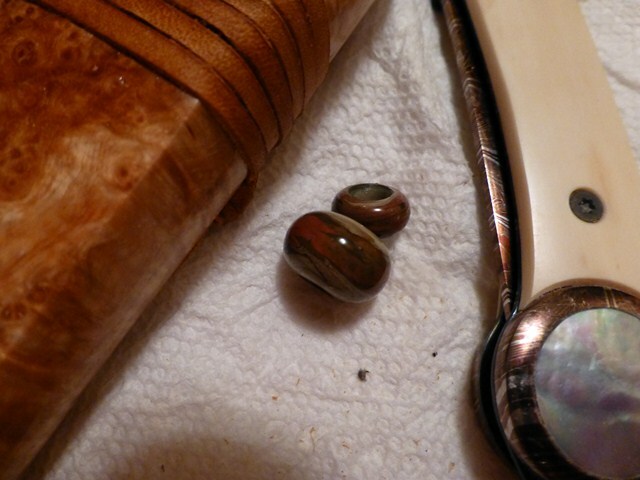 As you can see, the case has a band with the same leather as the lanyard and is fashioned with a smaller version of the bead. Only the finest materials were used to bring Indian Summer to life, and it certainly shows! I’m extremely proud of the results Max yielded from all his hard work! He encountered many obstacles during this highly ambitious project, but not once did he consider giving up. As a result, he accomplished something truly extraordinary. His resolve is an inspiration that helps keep me determined in the face of my own struggles. Max, HUGE congrats on a job well done! Brent, if you’re reading this, you’re one lucky man and a great person! Max and I are happy that his work is going to a person who can appreciate fine craftsmanship. I truly hope you’ll enjoy your knife for years to come. Just don’t go around stabbing people. Click here to see my earlier post with more photos. We are currently planning a website so Max could share all of his fine creations on a grand scale. For now, you can check out the step by step process of how Indian Summer was completed on his blog on LiveJournal. Click here for the thread on this specific project. As for the rest of his blog, he mainly posts in Russian, but feel free to check it out if you’re interested. This entry was posted in Life, Uncategorized and tagged arts and crafts, Blade, Brent Spiner, case, Damascus steel, handle, Indian Summer, knife maker, Knife making, lanyard, leather, mammoth ivory, Max, Metalsmithing, mother of pearl, projects, Star Trek The Next Generation. Bookmark the permalink.